It's really hard to describe the city's newest DavidBartonGym—you just have to be there. The sleek, gothic fitness chain that wants you to "look better naked" just opened its fourth Manhattan location inside the church-turned-nightclub at Limelight on the corner of 20th Street at Sixth Avenue with an amalgamation of the old and the new. 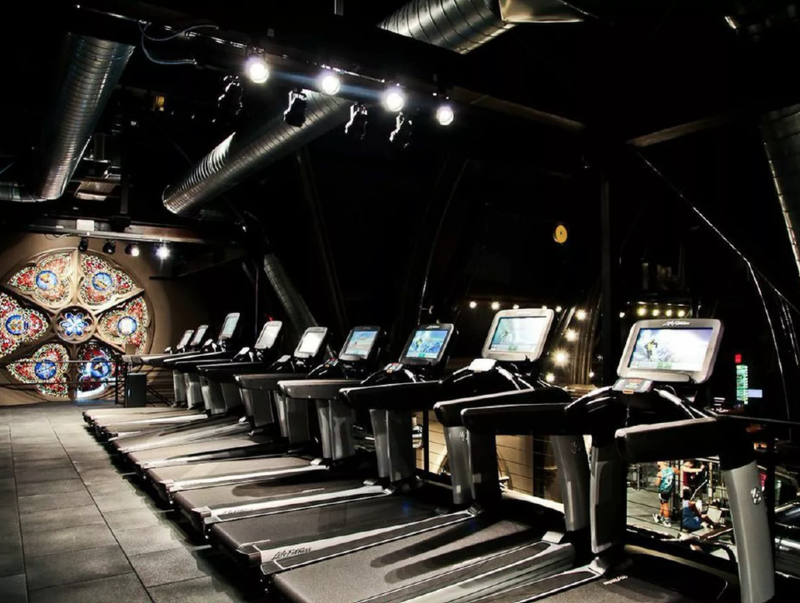 Original details like exposed brick and stained-glass windows that light up at night are contrasted with the latest, bronze-finished Life Fitness equipment, complete with a digital rep counter and QR codes that link to demonstration videos. On the cardio machines—placed on a loft with sweeping views of the entrance—choose from watching cable TV on a personal monitor, or link your Netflix or Hulu Plus account through your phone. Power-walking on an incline so much easier set to a Gilmore Girls marathon. The labyrinthine gym is full of staircases—one going up to the cardio area, another that goes down to the women's locker room, and so forth. So far, no one's gotten lost yet. On the lowest level, find the power lifting chapel, an area that was a nuns' chapel back in the church days and a secret bar in the club days. And upstairs in the group fitness studio, participate in appropriately-titled classes like Sunday Service and Core Communion. While the gym's been open for a week now, there's still some finishing touches to come, like chandeliers that are currently being customized in Spain and the restoration of the bell tower, which you walk up to get into the gym (the marketplace remains on street level). Both members and non-members alike can come in to confess their fitness sins every Tuesday between 4pm and 7pm starting on November 18th. Your penance? Diet tips and workout advice from the personal training staff that'll take your body to fitness heaven.